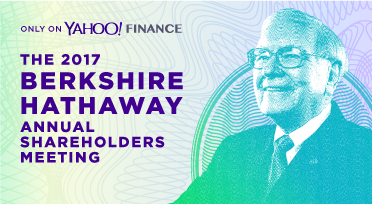 Yahoo Finance said it drew nearly 7 million viewers worldwide for its live-stream of the Berkshire Hathaway annual shareholders meeting last week. The second annual live stream reached a global audience of 1.43 million unique viewers on Yahoo, across all devices, up 30% from 2016 according to a post by Andy Serwer, Editor-in-Chief of Yahoo Finance. The company said engagement also increased significantly this year, with more than 3.1 million total live views on Yahoo, up over 72% from 2016. Audiences spent a total of 24.7 million minutes on Yahoo, up 38% from 2016, watching Berkshire Hathaway Chairman & CEO Warren Buffett, and Vice Chairman Charlie Munger, share their insights and advice, live from the CenturyLink Center in Omaha, NE. Additionally, through its live streaming partners in China, Yahoo saw another 3.89 million total live views for a combined 6.99 million total live views worldwide. In addition to on-demand replay on the site, Yahoo Finance has also made an audio replay of the meeting and accompanying interviews available via podcast for the first time ever, through a partnership with Acast. You can find it on iTunes and other podcast stores now. Warren Buffett ranks No. 4 on the list of most wealthiest people in the world with $73.4 billion according to Bloomberg.